We don’t like to brag about our more well known clients but we felt that not only could this weeks blog showcase another great job we’ve completed but also help try and find them the man of her dreams! 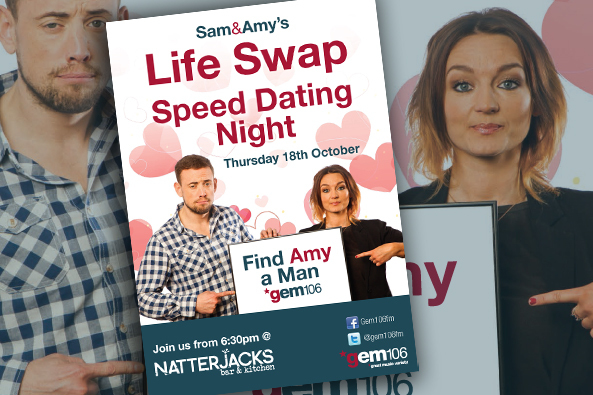 Having worked with Sam and Amy from Gem 106 before, it was no surprise when the contacted us and asked us to design a poster for their latest escapade – a complete Life Swap. Amy will be moving into Sams family home and Sam will be living Amys single life in Leicester. Whilst living Amys life, Sam thought it would be a great idea to arrange a speed dating night at a local Leicester Bar to “Find Amy a Man”. We came up with a cheeky little poster just for the team at Gem 106 and we hope that with the aid of Fifteen Designs creativity, we might be able to attract some eligible batchelors to whisk MS Voce of her feet! Fingers Crossed! Fifteen and The Wedding Vine say I do! It’s my birthday….tomorrow.